I hope everyone had a very Merry Christmas and happy holidays! It's always a little jarring when the year -- any year -- comes to an end. While thinking about resolutions for 2015 -- spending more time with family, more time with friends, more time going for much-needed walks -- I also want to take in the wonderful year that was 2014. We did some amazing things, and I know you did, too. Today's a good day to appreciate those amazing times before we forge ahead to make more memories. And while we had more than our fair share of fun times, we also had to deal with the heartbreak of losing Sassy, our more-than-patient, loving tuxedo cat. She will always be missed. One last thing I wanted to share was CC's letter to Santa. When I saw it, it made me tear up and remember that it's the meaningful things -- not the presents -- that make Christmas and the holidays so special. Hope your 2015 is amazing! The 55th Annual L.A. County Holiday Celebration Kicks Off Today! 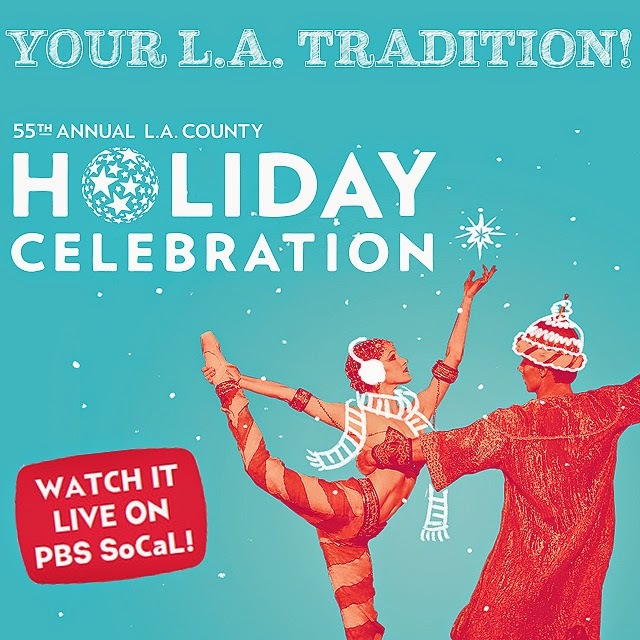 The amazing L.A. County Holiday Celebration -- a free Los Angeles tradition -- kicks off this afternoon at 3 p.m. at the Dorothy Chandler Pavilion. It's first come, first served, so grab some lunch and head downtown in order to get your free tickets. Entertainment in the Music Center plaza begins at noon. CC and I usually catch rehearsals, which are amazing, although sadly we didn't make it this year. Check out previous years' rehearsals here! If you can't make it downtown, be sure to tune in to the more than 20 music groups, choirs and dance companies on PBS SoCal! You can watch it live or during repeat broadcasts at 9 p.m. tonight and tomorrow at midnight and noon. Ian's mom joins us at Universal Studios Hollywood for the "Grinchmas" kick-off! Universal Studios Hollywood kicked off its annual "Grinchmas" shenanigans earlier this month, complete with Los Angeles Mayor Eric Garcetti, the Whos from Whoville and the green Grinch himself. The celebration continues daily at the park daily through January 4 and features live musical sets from Martha May Who-vier and the Who Dolls, as well as boy band the Wholiday Singers. Mayor Eric Garcetti joins the Grinch and friends at Grinchmas. Grinchmas visitors can also decorate their own ornaments and gingerbread cookies, and participate in the "Grow Your Hearts 3 Sizes" campaign by filling out a postcard listing their good deeds and mailing it to the Grinch. In return, Random House Children's Books, the publishers of Dr. Seuss's "How the Grinch Stole Christmas!" will pay it forward by donating a book to a child in need through First Book on behalf of the sender. And don't forget about the amazing 60-foot tree! With a backdrop of sparkling fireworks and a snow-capped Whoville scene, the Grinchmas tree literally lit up the night as the celebration got off to a colorfully animated start. 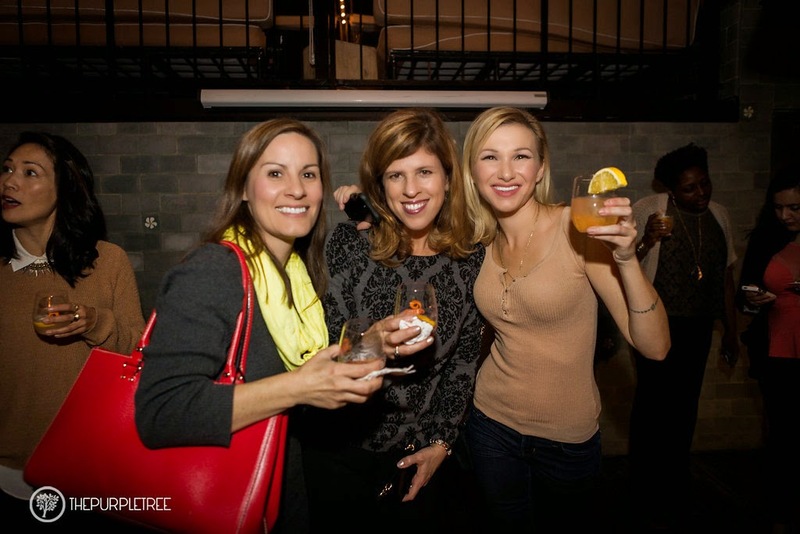 Moms' Night Out, Eppa Sangria Style! 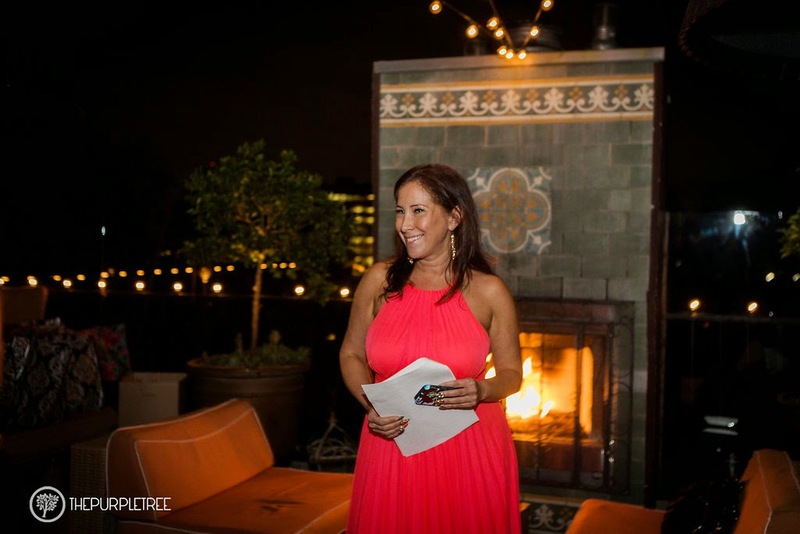 Several moms and I had the opportunity to indulge in a little Moms' Night Out a few weeks ago, when the always lovely Romy Schorr of Romy Raves hosted a fun night in West Hollywood to spotlight the tasty Eppa Sangria. We also made all-natural facial masks and had a pair of wine glasses personalized with special messages. Nothing like catching up with friends over sips and snacks -- while getting a massage at that! -- to rejuvenate you during the sometimes stressful holidays. 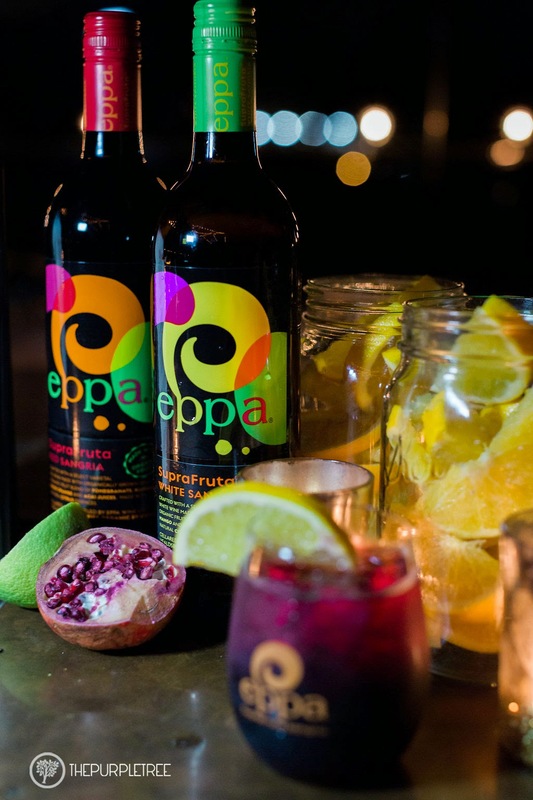 However, we'll definitely be adding Eppa to our grocery lists when we shop for Christmas, New Year's or just a Friday night celebration! While we love visiting Disneyland any time of year, going during the Christmas holidays is particularly special! We had the opportunity to head down to Disneyland Resort just before Thanksgiving to check out the park's transformation into a winter wonderland. Not only did the theme park just get merrier, its sister park Disney California Adventure got in on the holiday action, too. We kicked off our busy day with a trip on the always charming It's a Small World ride. We loved how the attraction had been transformed for the season. The singing global community inside boasted twinkly lights, snowmen and "Season's Greetings" wishes. CC and Will embark on the It's a Small World ride at Disneyland. In fact, according to Disneyland Resort, the park installed about 150,000 lights inside the ride. So pretty! The decorations all around Disneyland and Disney California Adventure are so festive. 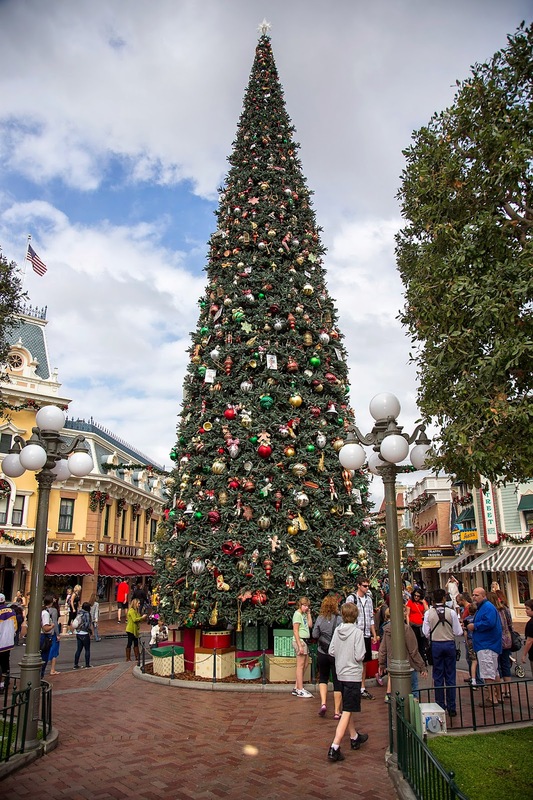 We loved the 60-foot tree that greeted us on Main Street, U.S.A, along with its 1,800 ornaments. After we caught the It's a Small World ride, we also had a chance to ride the hilarious and "punny" Jungle, er, Jingle Cruise ride, which had its own holiday theme this year, with the animals donning Santa hats and even a few ornaments. Very silly, indeed! We also caught the "Christmas Fantasy" parade, with 16 floats, including Santa Claus and Woody from "Toy Story," as well as classic Disney characters. We even caught a glimpse of rock star and mom Gwen Stefani taking her boys to the park. I definitely had a "Just Like Us" moment, when I saw her balancing water bottles, bags and a stroller. Ian got a great snap by the Main Street Christmas tree. CC, Gwen Stefani, her son Apollo and me. 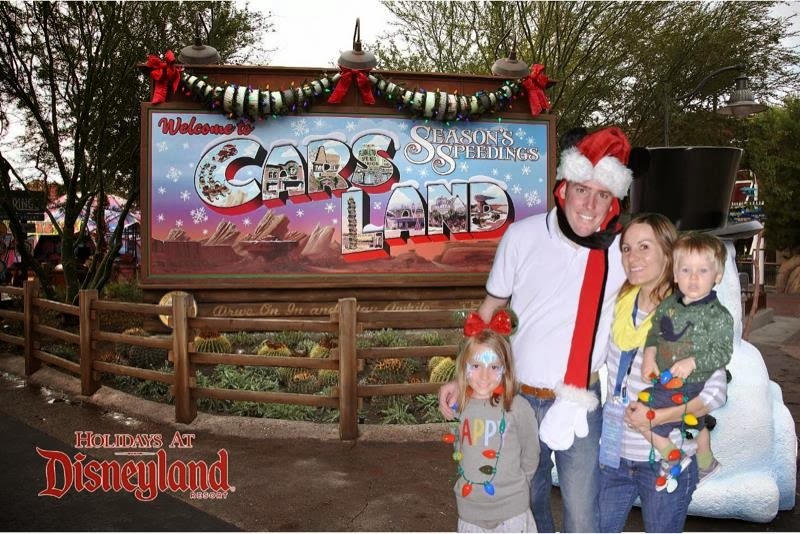 It was magical, and the Cars Land section is amazing! It's as if you're walking through a rugged landscape with Monument Valley-like rock formations in the background. CC and Ian rode the Cars ride, which I'll have to check out another time, but they said it was so fun. Meanwhile, Will and I caught the actual "Cars" characters driving through Radiator Springs. Cars Land is decked with holiday cheer. We took a break for dinner and then joined several bloggers at the Disney Grand Californian Hotel & Spa for some kid-friendly dancing and delicious desserts. CC even got the chance to meet Anna and Elsa from "Frozen." Queen Elsa and Anna from "Frozen" join CC for a snap. 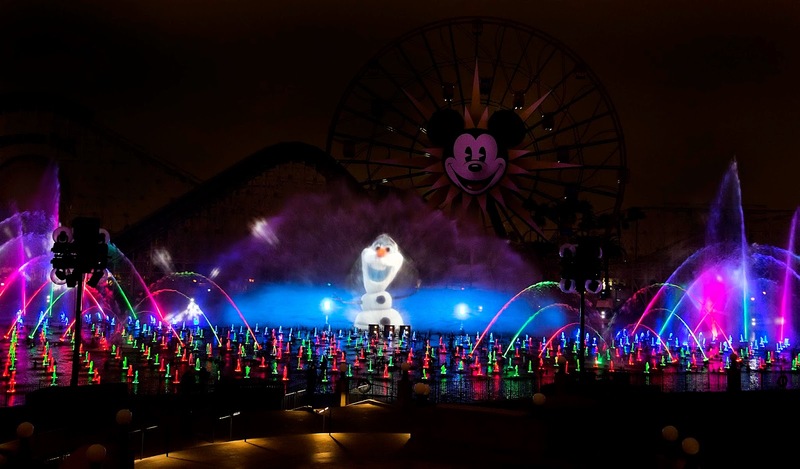 One of the most amazing features of Disney California Adventure has got to be the "World of Color -- Winter Dreams" attraction. The gorgeous water display, which creates a 19,000 square-foot projection screen all from fountains, features amazing colors but also projections from films such as the newly added "Frozen." They've even thrown in a bit of snow. All in all, we had an amazing time. And if I had a couple more hours with you, I'd make you sit through our rows and rows of photos. We took so many! It was such a great treat, and the kids went crazy. I feel so lucky that we live so close to Disneyland, but even though we've been to the park several times, it's always magical. Every time. There's something especially wonderful about each trip, and this one was no different. I would definitely recommend taking a day trip or a weekend down in Anaheim during the holidays. What a super-cool staycation that would be! Besides, you never know what rock star you might run into! Happy Birthday, CC! You're 8! Happy birthday, my darling CC! I can't believe you're already 8. How does that happen? Suddenly you're such a big kid. You're saying lots of big, mature words like mannequin, sarcastic and exaggerate. I love it! You are so smart, so beautiful and so confident ... something I hope you know to carry with you throughout your life. We had such a magical time yesterday at the Grinchmas kickoff at Universal Studios Hollywood! (More on that later!) Loved that the whole family was there and that Nattie was able to come just for you! The amazing Whoville tree lighting at Grinchmas at Universal Studios Hollywood. I love you so much! Enjoy! UPDATE: Congrats to Erin Murphy, who won the NCircle DVD 4-pack! Erin, please email me at losangelesstory@gmail.com with your shipping address. Thanks to everyone who participated, and stay tuned for more giveaways! With Thanksgiving now behind us and Christmas now officially on our radar, I wanted to share a few DVDs that will put your kiddos in the holiday spirit. CC and Will went bananas when we received a quartet of DVDs from NCircle Entertainment. "Yo Gabba Gabba!" is one of Will's fave shows. (He calls it "Gabba Gabba," minus the "yo.") And my animal-obsessed daughter loves the "Octonauts." These super kid-friendly DVDs are all about the holidays, so they're especially nice for lazy weekends like this one, when you'd like to indulge a bit with yummy leftover food and family time. So check out info below on how you can win these DVDs for your kiddos! In "A Very Awesome Yo Gabba Gabba! Live! Holiday Show!" (SRP: $12.99), kids can join DJ Lance Rock, Brobee, Foofa, Muno, Plex and Toodee as they dance, sing and decorate the tree to prepare for the arrival of Santa Claus. 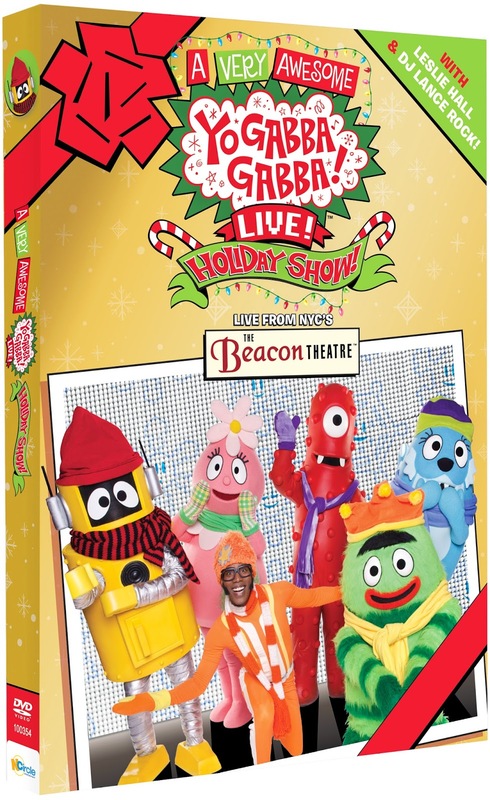 Filmed live at New York City's Beacon Theatre, the colorful cast of characters sing their hits, including "It's Wintertime," "Every Snowflake's Different, Just Like You" and a holiday version of "Party in My Tummy." 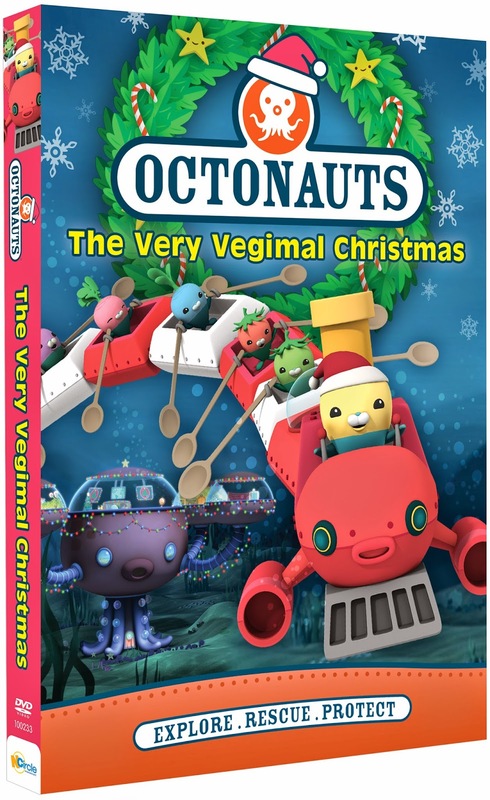 In "Octonauts: The Very Vegimal Christmas" (SRP: $9.99), the Vegimals' plans for a Christmas feast are interrupted when the Octonauts become entangled in a gigantic blob of sea snot. Yuck! The holiday excitement continues when the Octonauts travel to Professor Inkling's childhood home, an undersea mountain, but soon discover that a rockslide has endangered the local creatures. 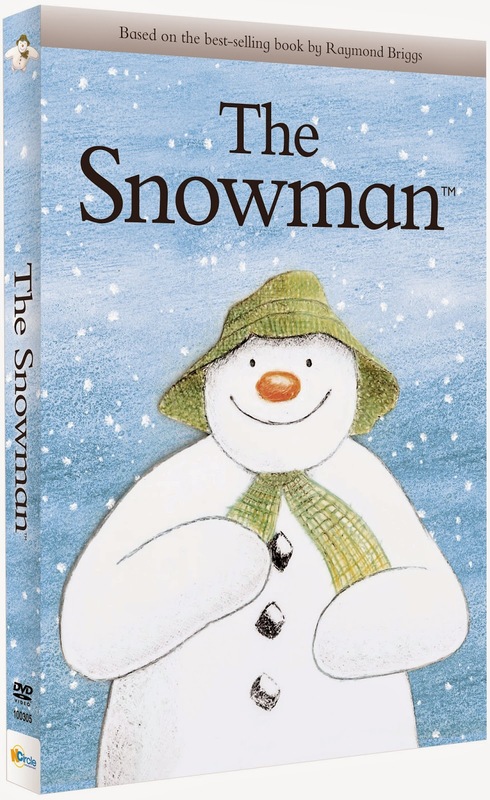 In "The Snowman" (SRP: $9.99), based on Raymond Briggs' book, a young boy wakes up one winter morning to find that a thick blanket of snow has covered the ground as far as the eye can see. Filled with excitement, the boy decides to build a snowman. Later that night, at the stroke of midnight, the snowman comes to life! The boy and the snowman then embark on a magical adventure that even takes them to the North Pole. 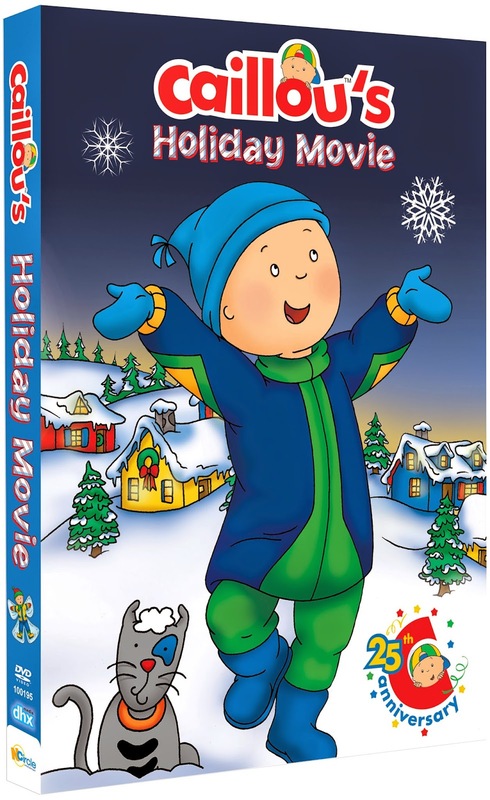 In "Caillou's Holiday Movie" (SRP: $9.99), the curious 4-year-old tackles all kinds of big-boy winter activities, like helping Daddy shovel snow, making holiday presents for his family and even discovering how little boys and girls all over the world celebrate the season! I'm giving away all 4 of the above NCircle Entertainment DVDs for a fun family prize pack! 1. Visit NCircle Entertainment and leave a comment below with your favorite DVD or franchise. 2. "Like" the NCircle Entertainment Facebook page. Good luck, and I will announce the winner on Monday, December 8! Hope everyone has a happy and safe Thanksgiving! I love, love, love Christmas lights! When I was younger, I used to beg my parents to drive through countless neighborhoods on the seemingly countless days that led up to Christmas, just to look at the sometimes over-the-top light displays in people's yards. Something about it -- like Christmas trees, hot chocolate and ice skating -- stirred up that otherwise dormant holiday spirit, and I was ready for Santa, presents and desserts (well, actually, that's every day of the year for me). 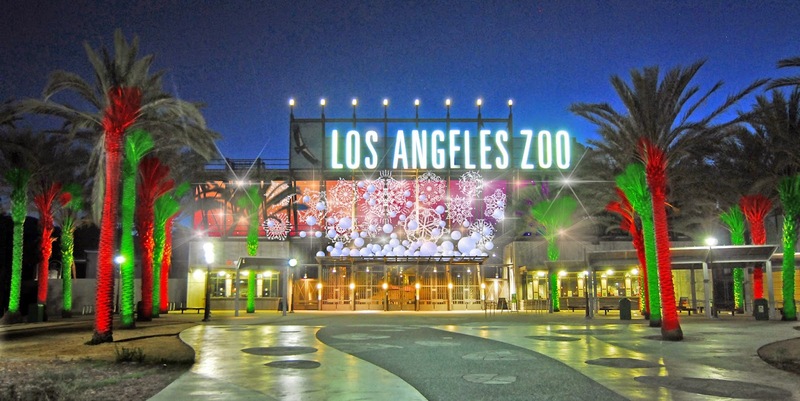 So I was excited to hear that the Los Angeles Zoo would be kicking off its inaugural light display, LA Zoo Lights, which will feature lasers, 3D projections and interactive sets in addition to the lights themselves. From November 28-January 4, with the exception of December 24 and 25, these fabulous lights will be on display. Grab the kiddos and head over! I know we will. It's especially exciting because LADWP hosted an amazing light show for years in Griffith Park that unfortunately ended in 2009. Luckily, Ian and I got to take CC to see it, but I'm happy that Griffith Park will have lights to showcase once again. This time, Will can see them, too! Early Bird Discount: Purchase tickets online to attend during the first two weeks (November 28-December 11) for the online-only Early Bird Rate of $8 each. CC is a big fan of "Sofia the First" on Disney Junior -- and Will is a big fan of the storybook app! -- so they were more than excited to celebrate the premiere of "Sofia the First: The Curse of Princess Ivy," airing tonight at 7 p.m. ET/PT on Disney Junior. With a specially themed party kit courtesy of Disney Junior, CC and Will donned paper crowns and made sticker scenes from the show. We're also inviting neighbors over for more "Sofia" fun! CC adjusts Will's crown while he plays with stickers from "Sofia the First." In "The Curse of Princess Ivy," Amber discovers Sofia's amulet is magical and takes it without asking. By accident, she summons the evil Princess Ivy, who wants to take over the kingdom of Enchancia and turn everything black and white. No color! There's even a special (animated) appearance by Rapunzel from Disney's "Tangled" (voiced by Mandy Moore). Anna Camp and John Michael Higgins -- both of whom starred in the must-watch "Pitch Perfect" -- join the "Sofia" cast, too. Will and CC have fun with "Sofia the First" goodies! Click on the video above for a sneak peek of the show! Have fun with the kiddos! "Sofia the First: The Curse of Princess Ivy"
You might have noticed a new line of kids' clothes making its limited-edition debut at Target. Annie for Target, a line created by "Annie" costume designer Renée Ehrlich Kalfus, boasts some adorable items in its little girl-centric closet. While the red party dress and the tutu skirt are definitely on the must-have list, it's the girls' band jacket ($24.99) that caught my eye on a recent trip to the store. Crafted from soft navy velour, the double-breasted jacket also sports silver metallic trim, shoulder epaulettes and emblem patches on the sleeves. 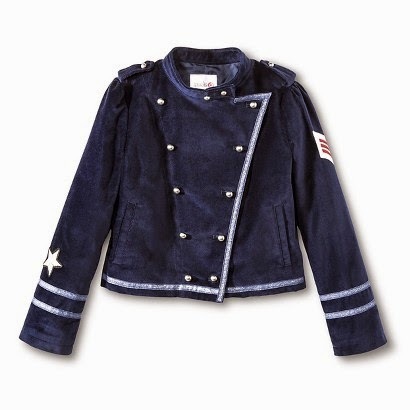 It's a sassy jacket, and I think it would be perfect for CC. For more info on the upcoming Sony Pictures re-imagining of movie-musical "Annie," opening December 19, check out the site here. "Mia: A Dancer's Journey" airs on PBS SoCal Nov. 20 at 7 p.m.
Mia Slavenska, Croatia's prima ballerina and a star on American stages in the mid-20th century, is a Southern California story in her own right -- having lived and taught dance here in Los Angeles for more than a dozen years. CC and I had the chance to catch a sneak peek of the film "Mia: A Dancer's Journey," premiering on PBS SoCal on November 20 at 7 p.m., at St. Anthony's Croatian Catholic Church downtown this weekend, and it was amazing to see the enthusiasm surrounding this special film. What first drew me to "Mia" was that it focused on a distinguished ballerina who had lived much of her life in the place we call home. Also, CC was so enamored of ballet for so many years that I thought she would have a connection to it as well. What I didn't realize was that the film is also about a mother-daughter relationship, one in which Slavenska's daughter, Maria Neumann, seeks to keep her mother's memory alive. While Slavenska worked on her memoirs during the latter part of her life, they remained unpublished when she died in 2002. This film was a way for Maria to bring her mother's story to modern audiences -- and it's fascinating. Slavenska left Croatia at the age of 20, after having achieved prima ballerina status at the Zagreb Opera and won awards at the Berlin Dance Olympics, which coincided with the infamous 1936 Berlin Olympics. Because of so much political unrest happening in Europe, Slavenska then emigrated to the United States at age 23 and performed with the prestigious Ballet Russe de Monte Carlo. After years with that company, she formed her own, eventually performing Tennessee Williams' "A Streetcar Named Desire" as a ballet. That was an especially modern concept at the time. Mia Slavenska as Blanche DuBois in "A Streetcar Named Desire" as a ballet. What I also loved about the experience was seeing the strong Croatian community in downtown Los Angeles. There were many supporters of the film that attended the screening, and it was amazing to see the connection between the audience and the woman on screen. Judging by what we saw on Sunday, Mia Slavenska will most definitely not be forgotten. "Mia: A Dancer's Journey" airs on PBS SoCal on Thursday, November 20 at 7 p.m.
CC says "Waaaaave" with the Pepperdine women's soccer mascot -- the Wave! My little soccer girl and a few of her friends got together a couple of weekends ago to catch a women's soccer game at Pepperdine University's gorgeous Malibu campus. The weather was perfect, as the girls watched the uber-talented college students show off their fierce skills on the soccer field. The Pepperdine Waves took on the LMU Lions, and it was seriously on. It was amazing to watch these young women be so aggressive on the field. I'm so used to watching 7- and 8-year-olds play soccer that I forgot just how intense and fast-paced the game can be. Not that elementary school soccer can't be intense! These women just kicked it up to college-level speed and skill. The Pepperdine Waves take on the LMU Lions against the beautiful backdrop of the Pacific Ocean. While the other moms and I watched in total awe, the girls seemed to take a more laid-back approach to the game. They enjoyed it, but they also wanted to play. I don't blame them. They're 7. What I especially loved was that the women's soccer team lined up after the game, and all of the kids were able to grab a poster and have it signed by all the members of the team. Each of the young women asked the kids' names and if they played soccer. CC gave an enthusiastic yes. CC gets her poster signed by a member of the Pepperdine Waves soccer team. Look forward to the day when my little midfielder is giving other little girls tips on how to shine while playing the game! CC at her last soccer game of the fall season. CC is getting excited for the upcoming November 26th premiere of "Odd Squad" on PBS Kids, but if kids want to get a sneak peek of the clever and hilarious math-friendly series, families can head to the Cinefamily Silent Theater on Saturday for a free sneak peek. 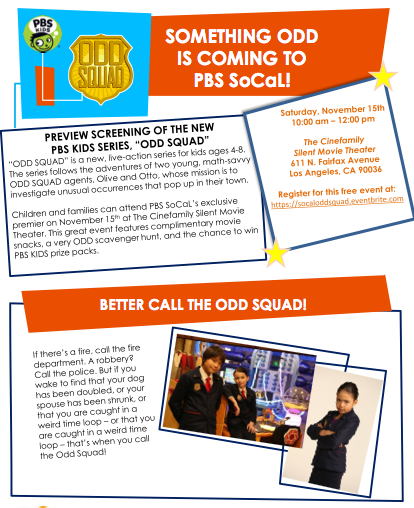 PBS SoCal is hosting a family-friendly event to get kids excited about the TV series, about a group of pint-sized sleuths who investigate unusual happenings around their town, using math concepts along the way. In addition to the screening, there will be snacks, a scavenger hunt and a chance to win prize packs! Sounds like so much fun for the kiddos! Get your free tickets here! Coming Attraction: 'Matilda the Musical' at the Ahmanson Theatre! 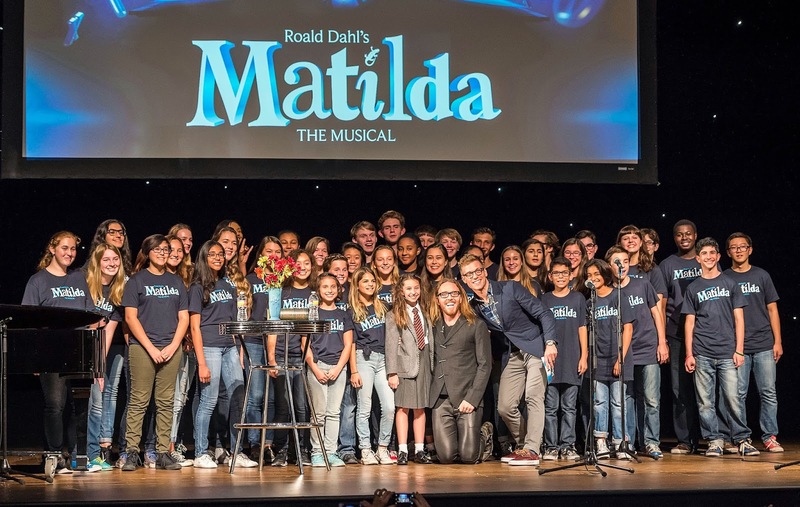 Composer/lyricist Tim Minchin, host Barrett Foa and former Broadway "Matilda" Bailey Ryon join the chorus from the Colburn School at the "Matilda the Musical" preview at the Ahmanson Theatre. Parents, get ready! Your kids are going to beg you to see the musical that will be hitting the Ahmanson Theatre next spring! "Matilda the Musical," the Tony-winning stage musical production based on the Roald Dahl book, has gotten lots of fanfare in London's West End and on Broadway, and it's now hitting Los Angeles on May 29, 2015. I was able to catch a sneak preview at the Ahmanson that featured Australian composer/lyricist (and dad!) Tim Minchin. He took on a lively and hilarious Q&A with host Barrett Foa, whom you might know from "NCIS: Los Angeles." Tim discussed his take on the musical and how he wanted to capture the inside of a brilliant child's mind -- and that he didn't want to make Matilda a "stagey" personality. She was the kind of kid who could process 1,000 thoughts before we could even finish one. She wasn't a showboat, but she was definitely special. If you're unfamiliar with the story, Matilda is a genius child who is completely unappreciated by her family and by the headmistress of her school, Miss Trunchbull. So what does she do? She results to carrying out creative pranks. It's only the sweet teacher Miss Honey who encourages her enormous talents and helps her to thrive. Former Broadway star of "Matilda" Bailey Ryon hit the stage to perform a couple of songs from the musical. And Tim Minchin himself played a touching ballad from the show. CC in front of the Berlin Wall segment on Wilshire Boulevard in 2009. To commemorate today's 25th anniversary of the fall of the Berlin Wall, I wanted to refresh some pics I've posted before about the historic structure from Los Angeles' German sister city. You might have passed the above segment of the Berlin Wall if you've driven along Wilshire Boulevard's Miracle Mile. While these segments arrived in LA in 2009, as part of the 20th anniversary of the fall, they've changed a bit since then. 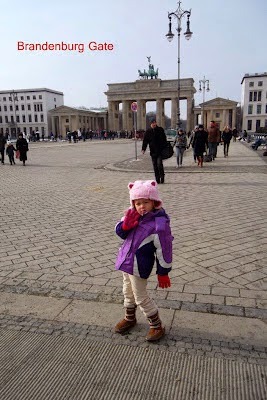 I'm still so happy that I was able to take CC to Berlin in 2012 for the city's international film festival. What's also meaningful is that I found out I was pregnant with Will on the day we left -- which also happened to be my birthday. It was really special. We can't wait to go back again. CC in Berlin in 2012. UPDATE: Happy Halloween, and congrats to Melissa Teears, who won the "Modern Family" gift pack! Please email me at losangelesstory@gmail.com with your shipping info. Thanks so much to everyone who participated, and check back for more fun giveaways! The family dynamics, from goofy Phil and his childlike charm to the hyper-neurotic Claire to the loveable couple of Mitch and Cam, are always relatable and hilarious. (Hello, school drama!) Love them! 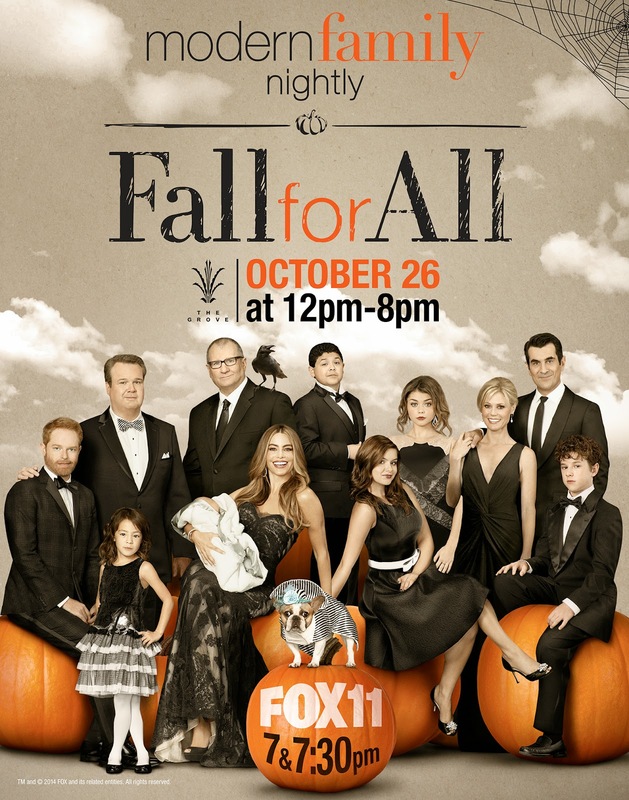 So we're excited to hear that a fun family event in honor of the show is hitting The Grove on Sunday, October 26, from 12 p.m.-8 p.m., thanks to its syndication station Fox 11. 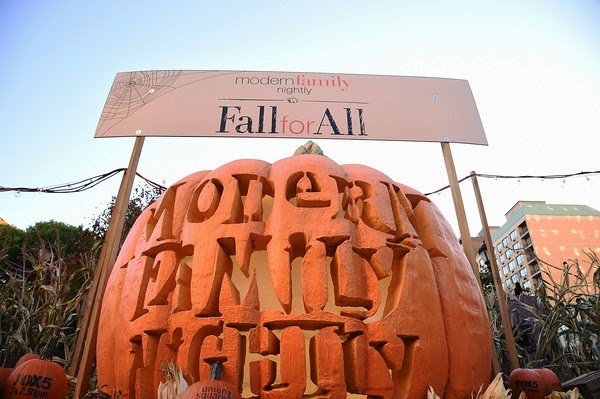 "Modern Family's" Fall for All event will bring Halloween fun to The Grove and feature family-friendly activities such as a 60-foot long corn maze, a seriously large pumpkin like the one pictured above from the New York event to head up the pumpkin patch, as well as a flower-making station and face-painting. And did someone say Halloween Candy Bar courtesy of Hershey's? Yum! I'm giving away 1 amazing "Modern Family" gift bag, filled with the complete DVD collections for Seasons 3 and 4, plus a tee, tank top, sweatpants and a reusable tote bag—all worth $200! 1. Leave a comment, telling me your favorite "Modern Family" episode, scene or character. Good luck, and I will announce the winner on Monday, October 31! Happy Halloween! UPDATE: Congrats to boyzrule, who won the Family 4-Pack of tickets to STEAM Carnival! With nearly every parent I know talking about the Common Core and STEAM (Science, Technology, Engineering, Arts and Math) in the school curriculum, I'm happy to hear about an inaugural family-friendly event that celebrates learning. The STEAM Carnival kicks off this weekend, October 25-26, at the Port of Los Angeles, and there will be lots of games and activities created just for kids. Not only that, but I'm giving away a Family 4-Pack of tickets to STEAM Carnival (see below). Created by Two Bit Circus, an engineering entertainment company, STEAM Carnival will feature tech-friendly games and carnival-style entertainment. There will also be plenty of artisanal food. Rooms with lasers? Check. Mad Science demos? Check. Musical robots? Yes, and more! 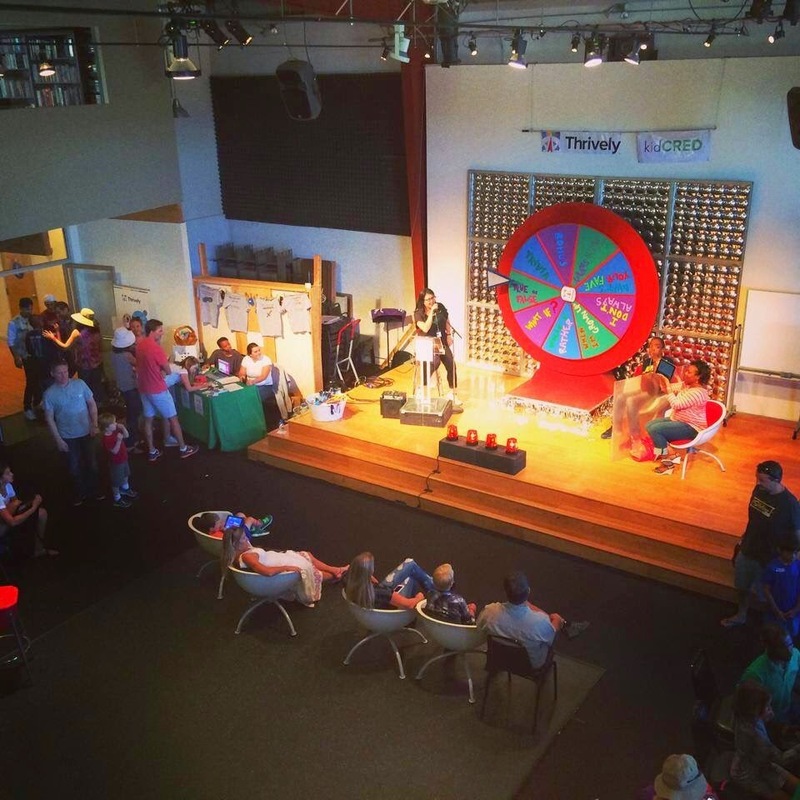 There will even be Kid Cred, a game show inspired by "The Newlywed Game," in which parents are tested on their knowledge of their children's interests. The game was created by Thrively, a family website that helps kids discover their passions. This sounds like such a fun way to get outside and spend time with the kiddos while also encouraging them to get involved in science, tech, and the arts! I'm giving away a Family 4-Pack of tickets to STEAM Carnival! 1. Visit STEAM Carnival and leave a comment with what you would like to check out at the event. 2. For more chances to win, follow me on Twitter and retweet this giveaway. I'm at @la_story. 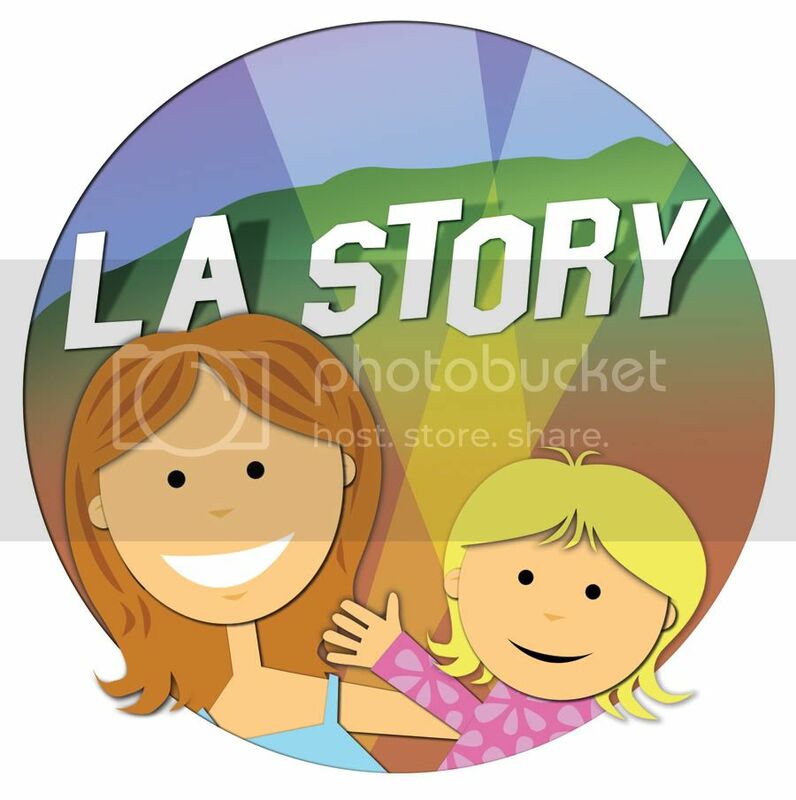 Or you can "Like" the L.A. Story Facebook page and share the giveaway. UPDATE: Congrats to Jessibeth Vicenty, who won the NCircle Entertainment DVD prize pack! Please email me at losangelesstory@gmail.com with shipping details. Thanks to everyone who participated! Will has become obsessed with The Wiggles. Obsessed. That's why I was happy to see a new DVD out from NCircle Entertainment featuring that favorite kids' group from Down Under. 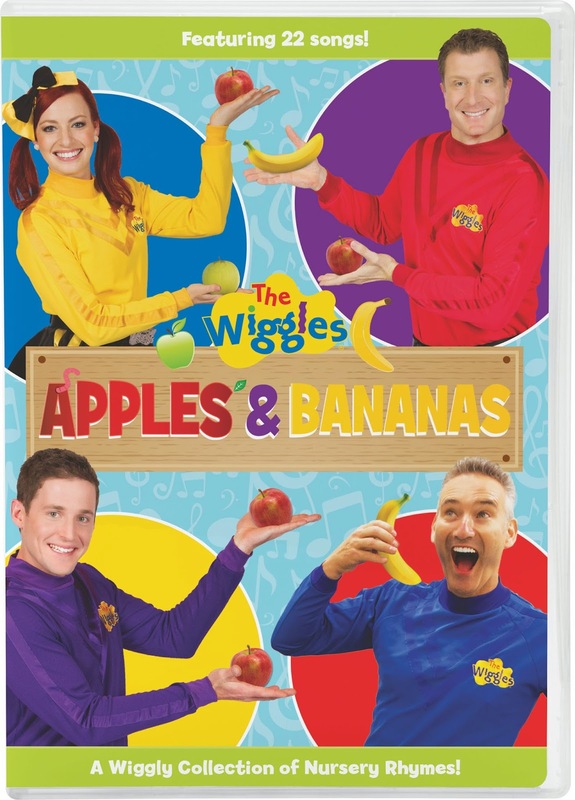 "The Wiggles: Apples & Bananas" (SRP: $9.99) offers up 22 songs on the DVD, including "The Wheels on the Bus" and "This Old Man Came Rolling Home!" that help teach little ones early preschool skills, such as counting and literacy. With "Apples & Bananas," Will points at the screen and shouts out words like "puppy" and "bear." I love to see him interacting with the Wiggles crew (which has now added Emma Watkins to the group!). 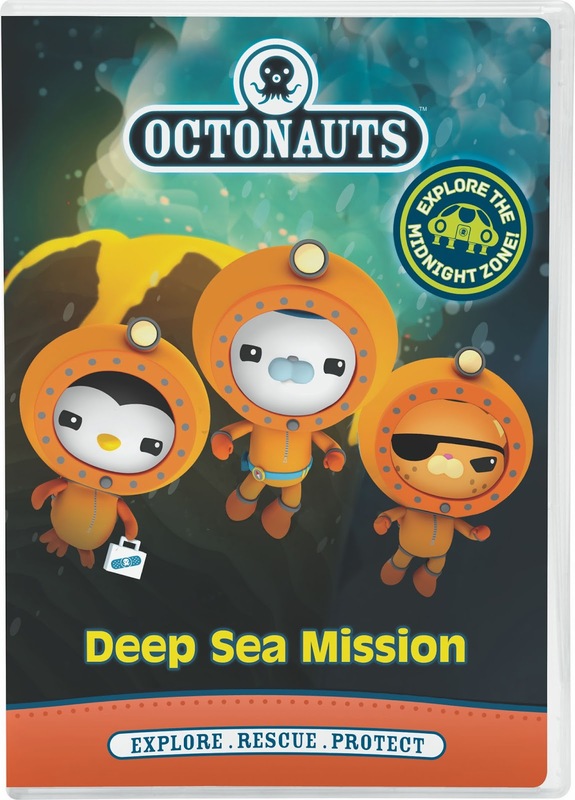 CC was more than excited, too, when we also received a copy of "Octonauts: Deep Sea Mission" (SRP: $12.99) for review from NCircle. In this DVD, the crew heads down to the hidden depths of the Midnight Zone. Along the way, they discover creatures that can only be found deep down in the ocean. One of CC's favorite episodes involved a blobfish. And watch out for the vampire squid! I'll be giving away those two new NCircle DVDs plus three more! 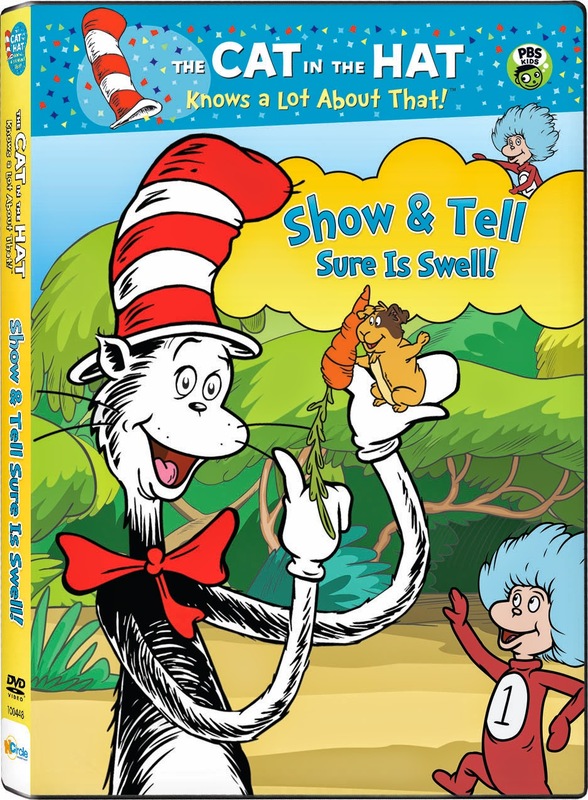 "The Cat in the Hat Knows a Lot About That: Show & Tell Sure Is Swell!" 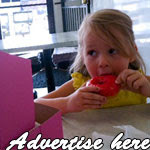 (SRP: $10.99) focuses on back to school. Our favorite part about going to class? Why show and tell, how great you should ask! Kids will also learn about the different seasons with the super-fun voice of Martin Short. 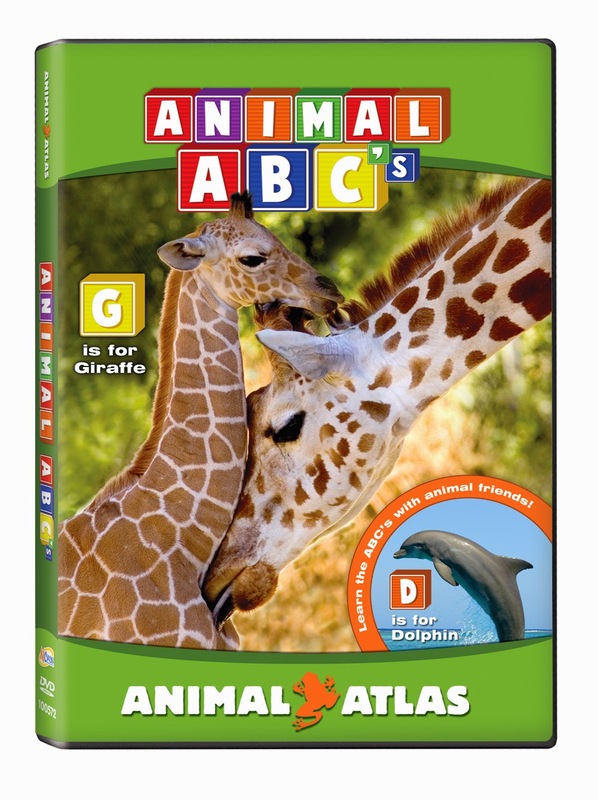 In "Animal ABC's: Animal Atlas," (SRP: $6.99), preschoolers will be introduced to a wide variety of animals as they also learn the alphabet and what letters are at the beginning of animal names. The DVD features songs, rhymes and puzzles. 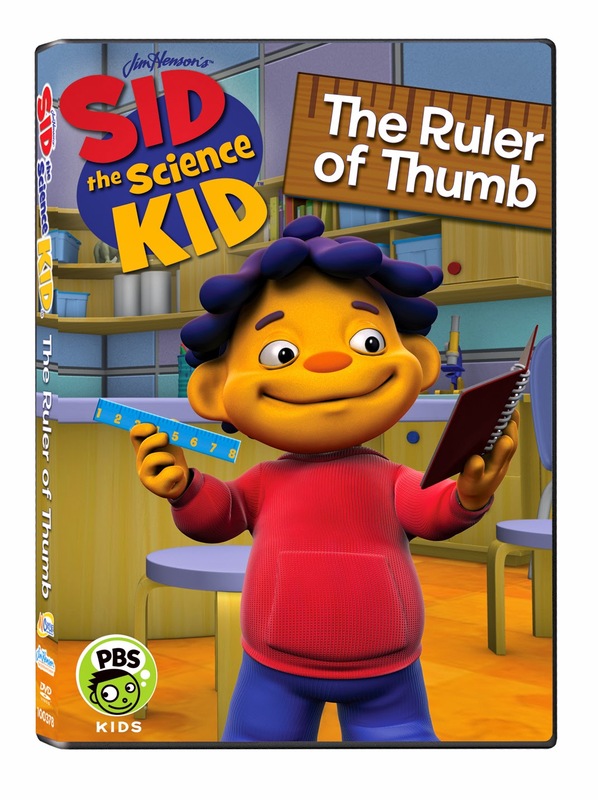 And in "Sid the Science Kid: The Ruler of Thumb" (SRP: $6.99), our preschool pal Sid learns how important different tools are in science. Take his chore chart -- parents will appreciate this one! While he needs to fill it up with stickers so that he can get a new toy, he also learns that you can compare and contrast using charts. And while checking out a roly poly, he also discovers the joys of magnifying glasses. I'm giving away all 5 of the above NCircle Entertainment DVDs for a fun family prize pack! Good luck, and I will announce the winner on Monday, October 27! 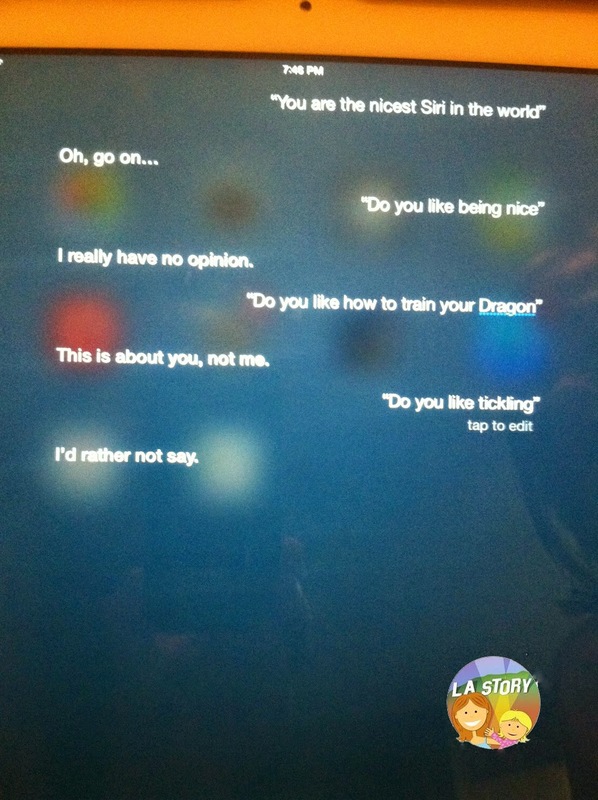 CC had this conversation with Siri on the iPad last night. Last night I heard CC talking to someone—but that someone wasn't a someone. It was a something. In what could be the non-romantic child's version of "Her," CC was having a pretty lengthy conversation with Siri—Apple's so-called "intelligent personal assistant"—on our iPad. 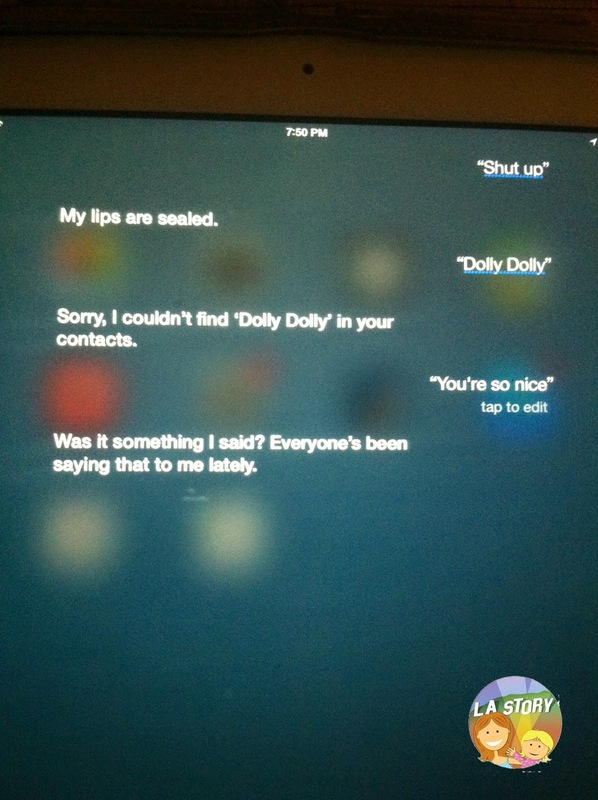 And Siri was surprisingly clever, and at times sassy and coy. CC, admittedly, was being pretty sassy herself. CC: You are the nicest Siri in the world. CC: Do you like being nice? Siri: I really have no opinion. CC: Do you like "How to Train Your Dragon?" Siri: This is about you, not me. CC: Do you like tickling? Siri: I'd rather not say. Siri: Was it something I said? Everyone's been saying that to me lately. I wish I had taken more pictures of their conversations—one involved an IQ test for some unexplainable reason—but it was funny to think that CC had been so eager to have a conversation while her parents were busy and her little brother was, well, being a toddler, that she just struck up a chat with someone she knew would talk back. Although I guess I'll have to start worrying if Siri starts initiating conversations with us.